If you’re wondering where to go for fall foliage, this is a great place to start. The Missouri Botanical Garden features nearly 80 gorgeous acres of specialty gardens. There’s certainly no shortage of reds, golds, and other seasonal colors. Who says you can’t enjoy the outdoors once it gets cooler? This rooftop bar offers an unprecedented experience for every visitor. If you’re hungry for a light dinner, be sure to order the street tacos and sliders. Don’t worry about getting cold, as Three Sixty features an outdoor firepit to keep you and your group cozy throughout the evening. What could be a better fall afternoon than exploring 1,200 acres of green space and several free museums? There truly is something for everyone at Forest Park. Not to mention, it’s just a quick trip west of downtown. St. Louis and Anheuser-Busch go hand in hand. Fall is a great time to do this brewery tour if you’ve somehow never gone. Visit the brew floor and get a close-up look at the fermentation cellars behind one of the most recognizable brands in America. Blueberry Hill has been a St. Louis staple for more than 40 years and it’s no secret why. This is so much more than just another restaurant in town. The internationally known Duck Room is rocking with live music several nights a week. Interestingly, Chuck Berry (yes, the father of rock and roll himself) duck-walked across this stage over 200 times. Here’s a fun fact: Tower Grove Park is the only public city park in St. Louis to be managed by an independent Board of Commissioners and staff. Visitors can check out the Chinese- and Turkish-style picnic pavilions, as well as statues of The Bard and Christopher Columbus. Without a doubt, this historical park is a must-see during the fall season. The Wild Flower Restaurant is more than just another place to eat. For one thing, this one-of-a-kind restaurant sits in the trendy Central West End. At Wild Flower, patrons are treated to a charming atmosphere and, of course, a delectable menu. Whether you’re overdue for brunch with your family, a date night with your significant other, or drinks with the crew, you can count on the Wild Flower staff to make it memorable. Don’t forget to try any one of our mouth-watering desserts! 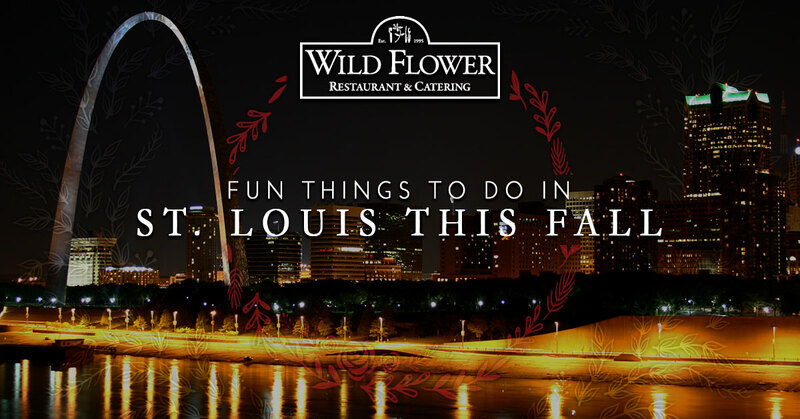 Stop by Wild Flower Restaurant & Catering for fine dining options.